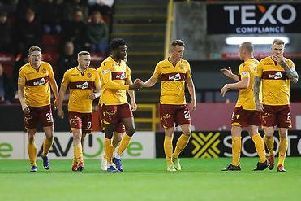 Motherwell midfielder Chris Cadden made his senior international bow in Scotland's 2-0 friendly defeat in Peru in the early hours of this morning (Wednesday). Bellshill-born Cadden (21) replaced Kenny McLean in the 87th minute in Lima, as former Motherwell gaffer Alex McLeish’s side were defeated in the first of two international matches. Scotland next travel to face Mexico on Sunday morning. Cadden's appearance marks the first for Scotland by a current Motherwell player since Steven Saunders in 2010. Goalkeeper Jordan Archer looked suspect at both goals of the inexperienced Scots' defeat. The 25-year-old Millwall player collided with skipper Charlie Mulgrew en route to Peru gaining the penalty that saw them take the lead after 37 minutes through Christian Cueva. Jefferson Farfan’s goal shortly after half-time also looked to go through Archer but defenders were also culpable in the run-up to the strike from near the edge of the six-yard box. Boss McLeish said: “Peru are at at better level than us, we have to be honest on that,” said McLeish. “But I don’t think that’s a secret and I believe that the Peruvian team and management felt they could beat Scotland easily. "Maybe we have to do other things to try to get some kind of result but overall the organisation of the team was good, the players concentrated. “Some players haven’t played at this level before but I do see a very good level in the Peru team. They have improved from the beginning of the coach’s time.